For Bolongo Bay, a significant first step project to address flood runoff issues could be coming soon. “The initial project that we’re going to do basically will convey the water in a drainage system that is now just running on the road and through the property freely. So we convey it in a way that will elevate some of the issues and hopefully in the long run unless it really is an enormous 100 year type flood the regular rain that we see should not impact them,” Nelson Petty Jr, Commissioner at the Virgin Islands Department of Public Works said in an interview with CBS USVI News. This plan could help divert water from flowing to beach, saving the resort and the future of other local businesses. Commissioner Nelson Petty Jr. with the Virgin Islands Department of Public works has been working with people like Richard Doumeng at the Bolongo Bay Beach Resort since before the 2017 hurricanes. Doumeng said they were close to launching a program that was long in the works to address the problem. “Well it was already heartbreaking to go through Irma and Maria at all but after the dust settled so to speak when we realized we were so close to having it go out to bid, right literally weeks before Irma it was supposed to go out to bid from property and procurement so to have it all stop after the years of planning was kind of heart breaking but now I am encouraged that instead of disappearing from the map we are actually still on the map and so all the work that has been done in the past is going to help us and not hurt us,” Doumeng added. 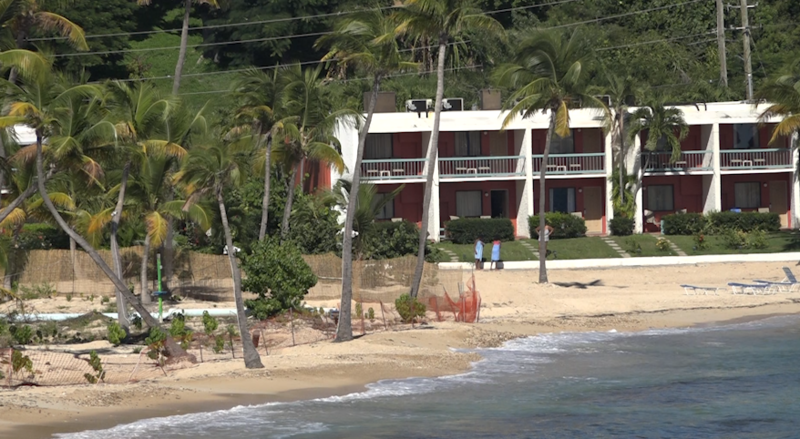 Doumeng showed CBS USVI News just how the water ends up at the beach. Showing reporter Kellie Meyer where it begins, all the way at the top of the hill, and then flowed down through local churches and local businesses. Then it all eventually ends up at his resort door step. Right now, this plan mainly focuses on the area around Bolongo Bay, but Doumeng hopes eventually it will be an all-encompassing approach to flood mitigation on this section of St. Thomas. “Hopefully we get to a point where we look at land use plan because it is not just Bolongo Beach it is the roads the amount of Public Works has had to put in to repaving over and over and over again I mean Commissioner Petty and the crew there were portions of Bolongo Road that have been done 4 or 5 times since the hurricane,” Doumeng added. Comissioner Petty said they have about $1 million in funding from the Department of Public Works for the Bolongo Bay Project alone. He also said they are waiting for the approval of funding from Army Corps of Engineers for $400,000 for pre-engineering work and comprehensive analysis. Petty said property owners can help by having the proper guidelines in place when they build, to control storm water runoff. That can help keep not only Bolongo Bay but all beaches in the Virgin Islands clean and safe for visitors and tourists. “And you see after every major rain DPNR releases a listing of which beaches are safe and which beaches are not and that is probably because of run off,” Petty added. As for Bolongo Bay, the new plan will soon be out to bid so work can start on the new drainage system to bring the runoff water more directly to the sea helping to save Bolongo Bay Beach. CBS USVI will continue to follow any new developments on this story as that project awaits approval.